At the moment I am juggling two books, one of which is The Last Christmas in Paris by Hazel Gaynor and Heather Webb. While World War II novels are quick to catch my interest, so are books set in and around the first World War. I knew I wanted to read this one the minute I first heard about it. You may say it is too early for Christmas-themed novels, but I already know this is much more than that. Life is forever changed without her; without the sense of her somewhere near. Empty hours wander by as I listen for the soft tread of her footfall on the stair and wait for her laughter to cheer these lifeless rooms. When I close my eyes I can conjure her; the scent of her perfume, the feather-touch of her finger-tips against my cheek, those intense blue eyes looking back at me. But it is all illusion. Smoke and mirrors that conceal the truth of her absence. I just love this introduction. It is part of the prologue that opens the book and sets the stage. It's evident that Thomas loved this woman and misses her terribly. I can feel his grief in this paragraph. Oddly, now I find myself asking, is "real life" what happens back in London? cars jamming the streets, people rushing about, ladies tending their gardens and buying new hats, men knocking back a fine scotch after a round of billiards at the club. Or is the reality here, harsh and unspeakable? Blood and flesh and all that senseless death. I thought I might share a bit of one of Evie's letters, but Thomas's letter to Evie takes center stage on page 56 and the pages before and after. This excerpt actually comes from page 57, but stood out for me in just how violence and war can shake one's perception and view of the world. He isn't the first to wonder, and unfortunately, won't be the last. What do you think? Is this something you would want to read more of? 2. Not being able to cuddle with, pet or be awakened each morning by my Parker disappoints me. 3. Reading is my way of slowing down and stepping outside the fast lane that life often can be. .
4. In retrospect, sometimes the biggest struggles and challenges we face are the ones that lead us to our greatest accomplishments. Because sitting on my husband's journal in the rocking chair is the best seat in the house. I don't think I've read many books set during WWI. 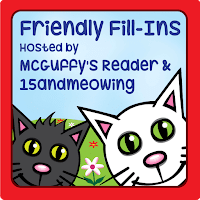 You're 4th fill-in is so true and Mouse's made me smile. Kathy - There are some great ones out there. I thought there was a male dog there with his leg in the air! I am so sorry for your loss, my friend. You wrote a truly beautiful piece. I agree with you about reading. And, thank you for #4. I hope you join us for Sparks. You are wise. Hugs. Annie - Haha! That would be fitting. :-) She and I actually have this silly little ritual of laying in bed and sticking one of our legs up in the air before she goes to sleep. Thank you for your kind words. Parker was such a wonderful kitty, and we all miss him so much. Thanks for stopping by, Annie! Laura - Same here. I don't know what it is about those two time periods that will draw me in just about every time. That's me voted for your October read - what a difficult choice it was this month. I've just commented on another blog how its been a while since I last read a war time saga. Not too sure this one captures my imagination but never say never. Tracy - Thank you for voting! I think it would be a hard choice for me too. I really want to read all three. I imagine this one might not be for everyone. It's been awhile since I last read an epistolary novel. I like your Fill-Ins, too, and understand about missing Parker. Years after we lost Sebastian, I still smile when I remember him...but feel sad, too. Thank you for your kind words. We have so many great memories with Parker, fortunately. I am sorry about your Sebastian. Thank you for participating, great answers. I am sorry about Parker though, I know how you are feeling. I completely agree with #4, so true. Ellen - Thank you on all counts. Our Gracie is missing Parker too, I can tell. She doesn't want to leave my side. We're comforting each other, I think. I agree with you that that is a poignant beginning. Hope you enjoy it. Roberta - I am glad you agree. :-) It is very good so far. Thank you for visiting! Hope you are enjoying your book! Stormi - It is good so far. Thank you for stopping by! Oh no, I feel like I'm behind. This is the second time today that I've seen a book with the word "Christmas" in the title. Breana - Haha! I generally don't read Christmas themed books until November, but I have a tour for this one coming up next week. As it turns out, it isn't really a Christmas themed book--it's just a word in the title. :-) Thanks for visiting! Harvee - I love a Paris setting! I hope you are enjoying P.S. Paris. This sounds great! Another book to add to my wishlist. Great fill in answers! Hope you have a great weekend! Yvonne - I hope you like it if you give it a try! I hope you have a great weekend too. Thank you for visiting! Ashley - I hope you do! I am enjoying it so far. Thanks for stopping by! I like both your selections. I'm a huge fan of WWI&II novels with a European setting too. Catherine - Thank you! It's really good so far. Thanks for stopping by, Catherine. I love the 56 excerpt. I'd say more, but I'm too distracted by the lovely kitty. I think cats like to let us know every once in a while that they are the ones with all the power. Happy weekend! Thank you for visiting, Alicia! 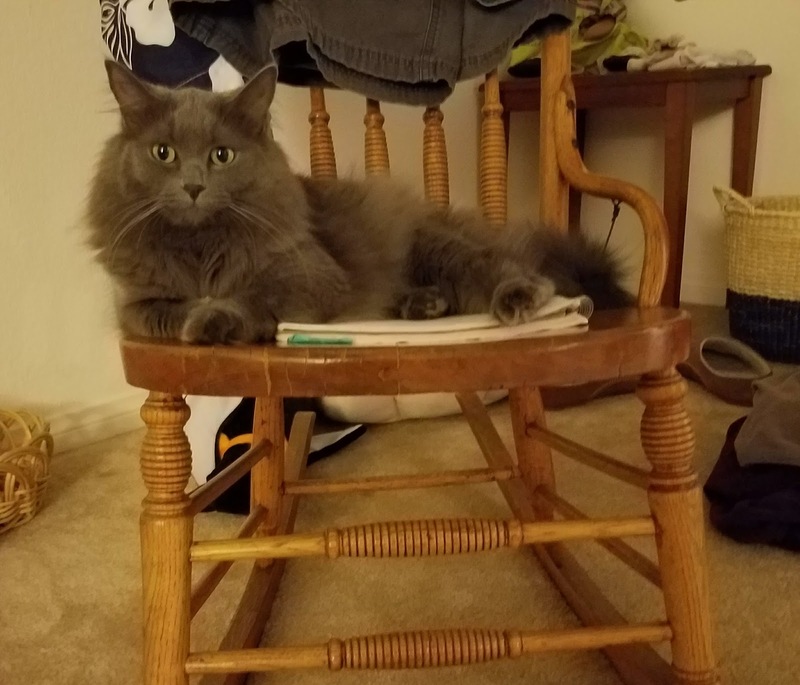 She loves sitting on that rocking chair. That's one of her favorite spots. :-) Thank you for stopping by! Both the beginning and the excerpt are emotionally intense. It sounds like a very moving story. Thanks for sharing the opening on BBOF! Sorry I was late getting the post up this week. Gillion - It is very moving. I am loving it so far. I love Christmas reads and can't believe it's almost that time of year already! Happy weekend! Freda - I can't believe it either. I'm not ready?! Candid Cover - I hope you do get a chance to read it. It's very good. Reading is one of the best things to do, especially good books. This one sounds excellent and sad, or at least bittersweet. 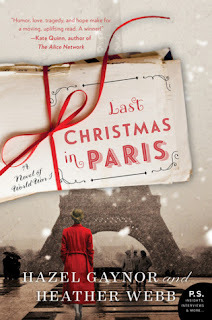 Messymimi - I do love to read, and am very much enjoying The Last Christmas in Paris. I love stories told through letters. And I love that cover- I mean Paris, obviously, but it has a nostalgic vibe too, almost. Have you ever read Letters from Skye? That was an epistolary novel set during both WWI and WWII. Wow, that sounds like a wonderful story. Thanks so much for sharing it here. The cover would draw my interest, too. As for what I'm reading, I have several books going. I can't remember the name of the one in my Kindle(its on the other side of the house right now), but it is something about preserving old family photos. As for real books, I am reading How I Got Here by Ceil Lucas and More Than Just Making It by Erin Odom, who is also The Humbled Homemaker. I love your answer to #4. It is so true! Suzanne - I am really enjoying it so far. It's a beautiful story. I hope you are enjoying your books! They all sound interesting. Thanks for visiting! You're welcome and thank you. I am enjoying the Erin Odom book especially. I can relate to much of what she has been through. Your number 4 is so true. As the saying goes, "That which doesn't kill us makes us strong." Then a quote from Aladdin, "You would be surprised what you can live through." For me, I just finished The Compass Solution by Tim Cole. In the Kindle, I am reading Make Art Make Money: Lessons from Jim Henson on Fueling Your Creative Career by Elizabeth Hyde Stevens. This one tells about how Henson used his art to fund more art. David - We always find a way, no matter how difficult the odds are. Somehow, someway. I hope you are enjoying your reading! The book by Jim Henson sounds especially interesting. I think my husband might like that one. Love the sound of this book, Wendy! I am now looking out for Christmas books. This looks wonderful! Sassy Brit - This isn't really a Christmas book, but it wouldn't hurt to read it around this time of year. :-) It's a good one. Thanks for stopping by!